Orange You Glad. | A Bushel of What? I attended a fun event last week at my local Whole Foods. I, along with two other local bloggers, Nikki Gardner of Art & Lemons and Mary Nelen of The Valley Locavore received a special tour of the store, with stops in each department to chat with the knowledgeable, friendly staff and sample some special "budget-savvy", holiday-party perfect snacks and beverages. We even received a tutorial in the floral department on creating inexpensive centerpieces for a festive table and had some fun rolling our own truffles. Of particular note was the non-alcoholic punch made with satsuma oranges, 12NtM Blanc (a sparkling beverage with a citrus-ginger blend of flavors), grapefruit, and "smacked rosemary". To get the most out of your fresh herbs when using to flavor beverages, in this case rosemary, take the rosemary, bunch it in your palm and then take your other hand and smack it a few times before adding it to the punch. Those little love taps release the fragrance and oils of the herb. Who knew?! Oh, and you know what else? The Hadley Whole Foods has their own blog, written by Sarah Kanabay. I'll be visiting it often for new ideas, for sure. Thanks, Sarah and the Whole Foods Team!! After leaving the Whole Foods event, I got to thinking about my December cooking to-do list; I had just finished making and canning our apple butter that we give out as gifts for the holidays. Still on the list are my biscotti and cranberry-orange marmalade that accompany the apple butter in little gift baskets we send to our family members. (Have you been good this year? If so, I'll post those recipes, soon.) I wanted to add something new to the package this year and I got to thinking about what I could make that was budget-savvy. The next morning, as I was peeling an orange for my son, I knew what I had to do; Candied Orange Peels. We had just received a box of tangerines and oranges from my father-in-law. My son has found a new food obsession, requesting at least two oranges a day. And what better way to use the whole fruit than to eat the orange and then save the peels for candies? 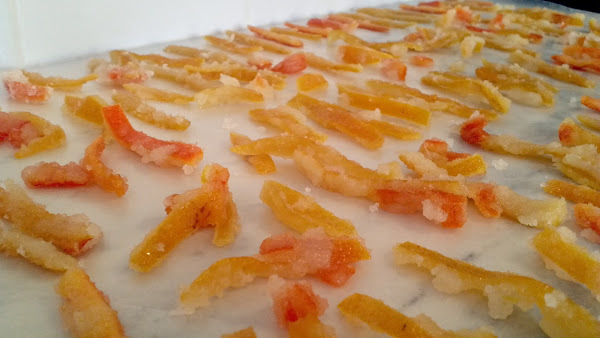 I collected and stored the peels, pith in tact, in airtight containers for about a week, until I had enough to make a large batch of candies. I removed the skin of the orange by first slicing the top and bottom off of the orange and then cutting the pith and peel away from the flesh in large pieces. 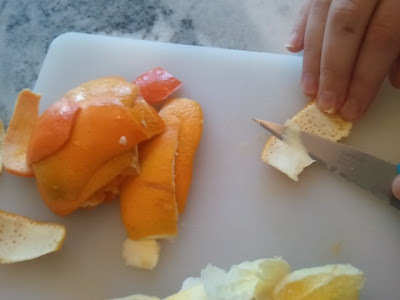 When I was ready to candy the oranges, I cut the white pith from the orange peel, which helps to cut back on the bitterness of the peel. Boil a large pot of water. Add the prepared orange peels and boil for 15 minutes. Drain, rinse peels, and then drain water again. Combine 3 cups of sugar and 3 cups of water in a medium saucepan and bring to a boil. Add the cooked and rinsed peels and simmer for 10 minutes, or just until the peels begin to appear translucent. Turn off heat and remove peels from the syrup* with a slotted spoon. Place 1 cup of sugar in a separate bowl. Toss peels in sugar. Lay out coated peels on wax paper and allow to dry for 24 hours, or until sugar is set and peels seem solid. Store in an airtight container. *After I removed the orange peels from the syrup, I realized that I could use the orange-infused syrup at a later date, probably in a cocktail of some sort. I poured the mixture into glass jars and I'm storing them in my fridge for later use. Looks yummy! 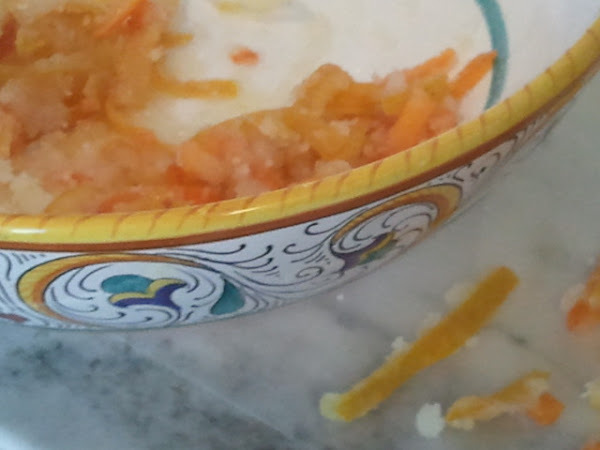 It might take me a while to save enough orange peels for the recipe, though.